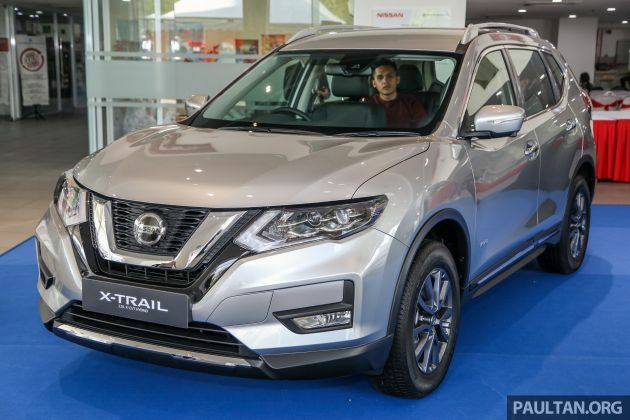 Edaran Tan Chong Motor (ETCM) has announced the official tentative prices for the 2019 Nissan X-Trail facelift, which are lower than previously estimated. Customers will be able to choose from four variants of the X-Trail, which includes a single hybrid option. Getting straight to the point, the base 2.0L 2WD goes for RM133,888, followed by the 2.0L 2WD Mid at RM145,888, the 2.5L 4WD at RM153,888, and the range-topping Hybrid at RM159,888. All prices mentioned here are OTR without insurance. All 2.0L models are powered by the MR20DD 2.0 litre four-cylinder engine, offering 144 PS at 6,000 rpm and 200 Nm at 4,400 rpm, while the 2.5L model gets a QR25DE 2.5 litre engine making 171 PS at 6,000 rpm and 233 Nm at 4,000 rpm. An Xtronic CVT is standard for 2.0L and 2.5L models. The sole Hybrid variant also uses the MR20DD, but it has been optimised for the hybrid system with an electric motor that makes 41 PS/160 Nm. A 0.9 kWh lithium-ion battery is also part of this system, contributing to the claimed average fuel consumption of 16.1 km/l. A CVT with Nissan’s Intelligent Dual Clutch Control is also part of this setup, where the “dual clutch” here refers to the clutch between the engine and the electric motor, and the clutch between the electric motor and the Xtronic CVT. Coasting is possible at speeds below 120 km/h – this decouples the CVT from the engine. The placement of the battery in the rear also means the Hybrid is a five-seater, as opposed to the rest of the range that comes with seven seats spread across three rows. Aside from welcomed equipment updates, the X-Trail gains a significant boost in terms of safety kit, with the top three variants getting six airbags as standard (four for the base model). Also making its debut here is Nissan’s Intelligent Mobility suite of driver assist systems, which includes Forward Collision Warning, AEB, Lane Departure Warning and more. For more information on the new X-Trail, check out our preview story, as well as our comparison with the pre-facelift model. Alternatively, you can also watch our first look video of the X-Trail facelift range in the video posted above. No 25k bookings, this will Game Over soon. Game Changing pricing by Nissan! X70 will be Game Over soon .. The safest & most affordable family SUV is back. Kesian. Nissan salesman bonus potong one more time. Hope Wilson Khoo/Jeffry Yap will not come here and bash Nissan. So, you quit your job as P2 salesman and become a fortuneteller? Cheapest base variant still much more expensip than top range Proton X70 with so much more gadgets and kit. Konpem tak laku jual. My Singapore cousin bought this beauty , for SGD 144,000 equivalent to RM 435,000 here. So its real bargain selling for only RM 130k ish here. Wow bravo TCM! Not only does this Xtrail is loaded with safety spec and kit it’s also 10k cheaper than the full spec CRV. Can we have the new Selphy and Teana too? Also while you are at it, your service centres are in dire need of a major overhaul. I would be more concerned about the CVT and build quality. My previous Nissan’s never felt that high of quality because it seemed to be screwed together by toddlers. Rattles everywhere! And the resale values were downright insulting because last time I checked Nissan isn’t from Korea or China. Proton X70 much better, value for your money. Under powered 2.0. Even the 2.5 deliver almost same power as 1.5 turbo.